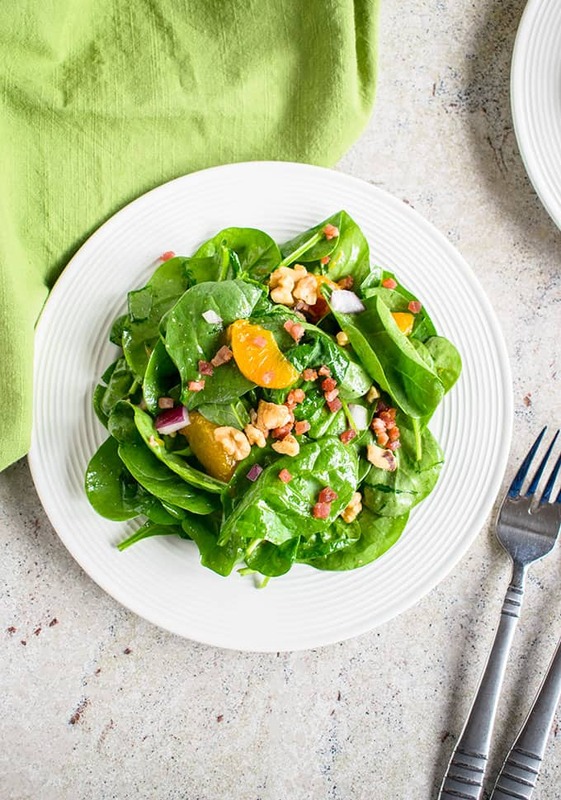 Make this refreshing Spinach Salad with Mandarin Oranges and Pancetta for the holidays! With red onions, toasted walnuts and a delicious orange vinaigrette. Meet the number-two salad in my life. It’s the understudy to the OG Best Italian Green Salad with Homemade Dressing. 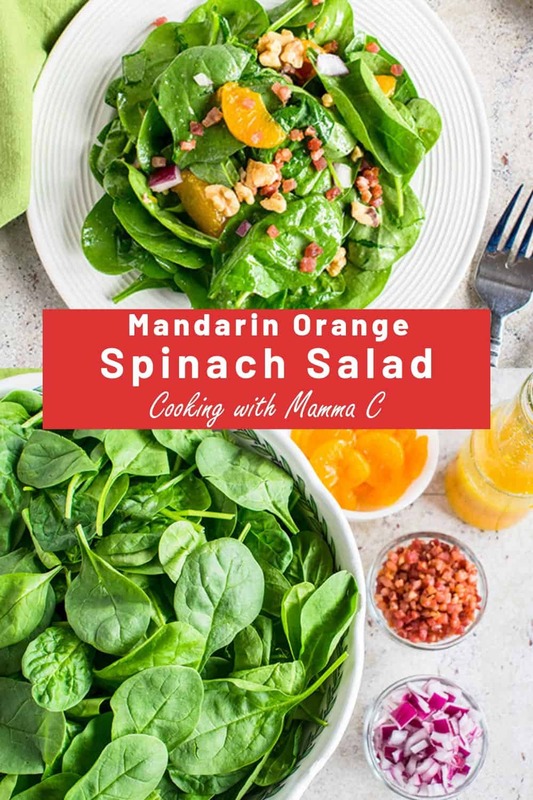 Which means…if company’s coming over for dinner, this spinach salad with mandarin oranges might make an appearance, for a delicious change of pace. And it steals the show, every time. You know you have a special salad when guests are exclaiming “Mmmm!” and asking for seconds. Maybe it’s the refreshing orange vinaigrette made with freshly squeezed orange juice and zest. Maybe it’s the saltiness of the browned pancetta bits complementing the sweetness of the mandarin oranges. Maybe it’s the crunch of the toasted walnuts and the crispy red onions, both of which bring big flavor. Or maybe it’s the subtle sweetness of the white balsamic vinegar (affiliate link), which is our family’s secret to fantastic, homemade salad dressing. 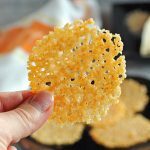 I modeled this orange vinaigrette recipe after the dressing I use in my Breaded Scallops over Salad with Lemon Vinaigrette. Neither includes any added sugar, honey or maple syrup. Because, these refreshing citrus vinaigrettes don’t need it. I don’t know about you, but I try to pay attention to how much sugar and sweeteners are in my food. Especially savory dishes. 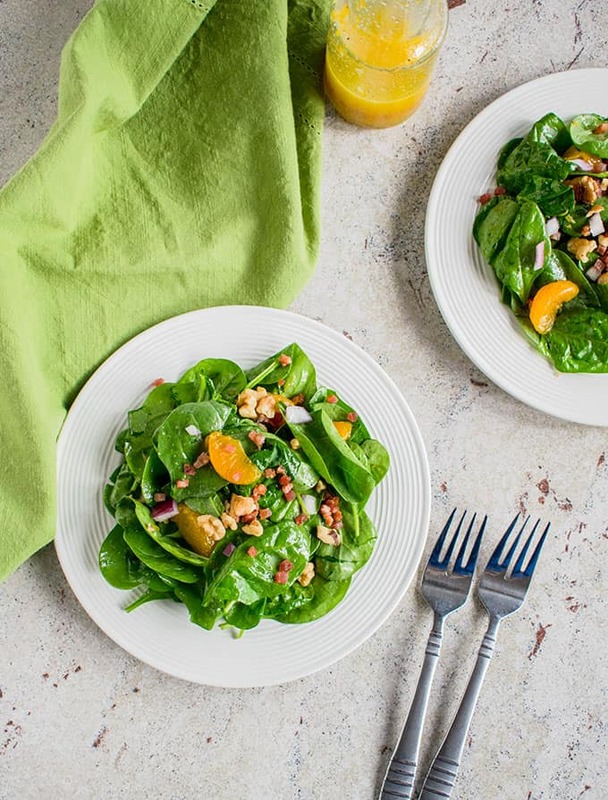 There’s no need for overkill in our spinach salad dressing, when we have sweetness coming from the mandarin oranges, orange juice and white balsamic vinegar. In fact, this is one healthy salad, minus the pancetta! Feel free to leave it out for a vegan option. We do that sometimes, and this spinach salad is still delicious. 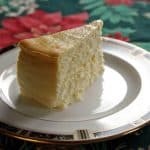 Consider adding it to your holiday menu or even Sunday supper. P.S. If you love salads, check out my Grilled Romaine with Toasted Walnuts and Parmesan and this Apple-Mozzarella-Pecan Salad with Maple Vinaigrette! 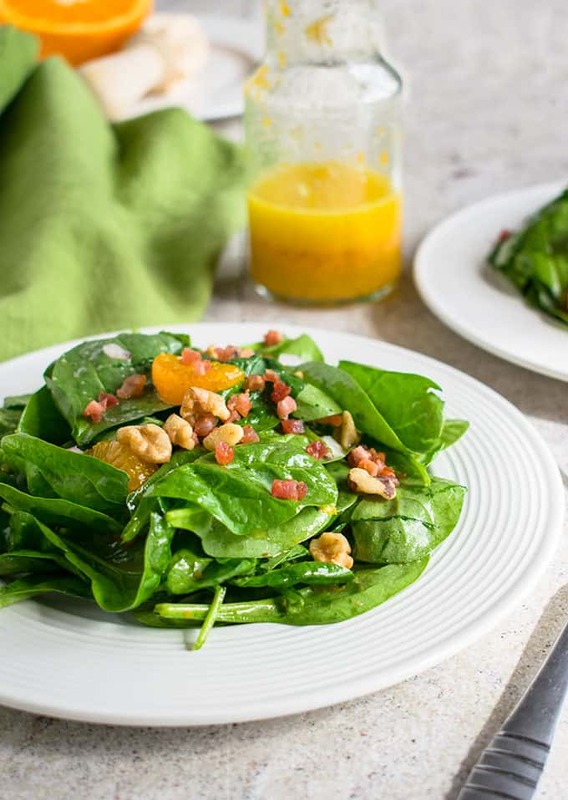 You'll love this refreshing Spinach Salad with Mandarin Oranges and Pancetta! With red onions, toasted walnuts and a delicious orange vinaigrette. Add the chopped walnuts to a skillet and place over medium-high heat on the stove, stirring occasionally, until fragrant. It should take at least two minutes. Transfer the toasted walnuts to a dish and wipe out the pan. Add the chopped pancetta to the pan and saute over medium-high heat, stirring frequently, until browned. It should take around six minutes. Use a slotted spoon to transfer the pancetta to a plate lined with paper towels. Blot the pancetta with a paper towel to absorb the grease. Chop around 1/4 of a red onion until you have 1/3 cup of chopped onions. Drain 12 ounces of mandarin oranges and set aside. 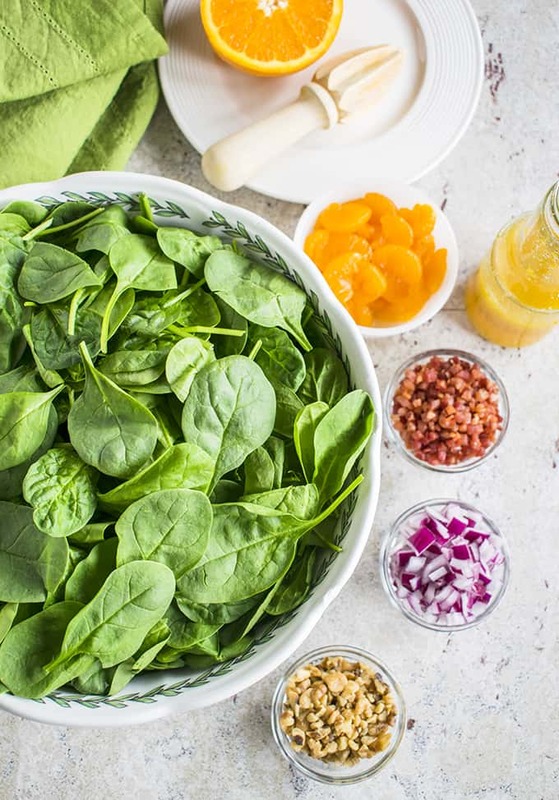 Place your spinach in a large serving bowl. Add the walnuts, pancetta, red onions and mandarin oranges. For the orange vinaigrette, rinse and dry off a large orange. Zest the orange and set the zest aside. Cut the orange in half. Add 1/4 cup olive oil to the measuring cup. Add the vinegar, zest, salt, garlic powder and pepper. Whisk to combine. Mix the dressing with the spinach in your bowl immediately before serving. Store leftovers in the refrigerator for up to four days. Feel free to omit the pancetta for a vegan option. 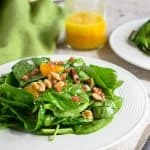 This spinach salad is still delicious without it! This makes 8 side-dish servings. I’m loving all these flavors! This would be perfect for a Thanksgiving salad. Thank you! 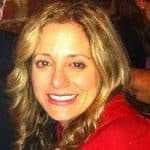 Hi Melissa – We love it for special dinners. Enjoy! What a tasty salad! 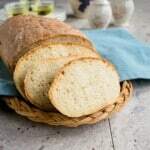 I love all the different flavours and textures in it. Sounds perfect to have as a light lunch. Hi Marie – We usually have this as a side salad, but a big portion with something on the side would work for lunch. Simple and delicious makes this kind of salad. I love the dressing and added pancetta. Thanks, Sharon! It’s the perfect side salad. Beautiful salad! 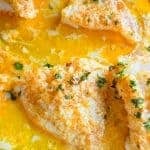 The dressing sounds fantastic and love the oranges! Thanks, Tisha! It is really good. This is such a pretty salad! And the orange vinaigrette sounds amazing! Hi Demeter – Thank you! We really love this. I love the idea of putting mandarins in the salad! Hi Krissy – They’re so refreshing here!